Together with NV 305 to the north, NV 376 forms half of a 200 mile drive across the middle of the Great Basin Desert in central Nevada, from Tonopah on US 6 to Battle Mountain along I-80, and is one of a small number of roads in the state designated by the American Automobile Association (AAA) as a Scenic Byway. 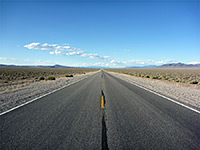 Like most other north-south routes in Nevada, Hwy 376 runs along a very wide valley, here bordered by the 10,000 foot summits of the Toiyabe Range to the west and the Toquima Range to the east, both part of Nevada's relatively small area of national forest land; en route are a few settlements, mines and ranches, but the majority of the surroundings are typically empty and barren. 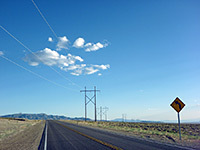 In the south, NV 376 starts with a ten mile straight through Ralston Valley, from a junction with the equally unbending and newly resurfaced US 6, five miles east of the friendly, historic town of Tonopah. 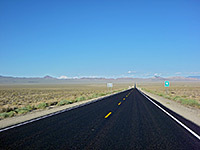 Directly ahead are the distant peaks of the Toquima Range, while the land to the west rises less steeply to the San Antonio Mountains, location of a few working mines, and the road passes quite close to one, before bending for the first time, crossing a low saddle and beginning the next lengthy straight, over a vast sagebrush plain. A small settlement comes into view every mile or so - some abandoned, and a few side tracks branch off, mostly to the east, yet all the land is fenced and privately owned, part of huge ranches. The far mountain tops are wooded but not a single tree grows anywhere closer. The hills start to approach closer to the east, as the road bends slightly a few times and descends a little into Big Smoky Valley, where it stays for the remainder of the journey to the US 50 intersection. Patches of irrigated farmland appear to the west, the bright green grass contrasting with the arid, yellow-brown color of most of the surroundings. 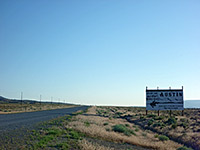 On the other side are large tailings piles and deep, stepped excavations, from the extensive mining operations at Round Mountain; soon after, the road passes the two tiny towns of Hadley and Carvers, this latter offering a few facilities including a gas station, store, motel, cafe and bar. A little way beyond, Darroughs Hot Springs used to be a developed attraction, but the site is now disused after the death of its elderly owner, and is not signposted. Another long (12 mile) dead straight section is followed by several gentle bends to the east, as the highway runs close to the steep east face of the Toiyabe Range, all part of the Toiyabe National Forest; many short side tracks head towards canyons and creeks that drain the wooded slopes, good locations for primitive camping. Development increases briefly around the residential community of Kingston, as quite a few houses are built in the foothills, but the land is empty once more for the final 20 mile straight to the US 50 junction, from where Austin is 11 miles northwest, on the far side of the mountains. Tonopah has a small choice of lodging.